A creative workshop for decorating and personalising all your own fashion I.D. tags. Use gemstones and paints, included, to design your tags. Attach them to handbags, school bags or hang them around your neck! 5 tags and accessories included…. This toy costs approximately £9.99 (for the latest and best prices make sure you check our retailer list for the The Tag Factory above). 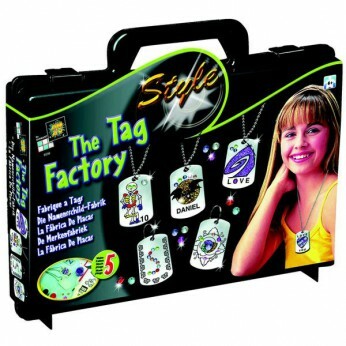 In our review of The Tag Factory we classed it as being suitable for ages 3 years, 4 years, 5 years but recommend you check the manufacturer specific advice before purchasing.